Bankruptcy is fast becoming an everyday topic of conversation. Like most specialties, bankruptcy law has a language of its own. It’s unfamiliar words and phrases make it difficult to comprehend. It is important to understand key terms and phrases while going through the bankruptcy process. Not only will this help when speaking with your lawyer, but it will also assist you if you are required to go to court. If you are filing for bankruptcy, it is important to understand each term so that you understand each person’s role and what is happening. You do not want to misunderstand the different types of debts or assets and confuse which debts may be wiped out or what property may be taken and sold in order to pay off your debts. If you don’t understand various financial terms may inadvertently damage their credit or even end up deeper in debt. Also, getting out of debt isn’t something you learn about in school. As a result, when you start to have problems, it can be difficult to make the right choices because you may not even fully understand the terms that are being used about your debt and the various solutions available. There are many terms used when it comes to credit counseling, debt, debt collections, and debt relief. Knowing what the various terms mean can help when you’re trying to get your finances back on track. 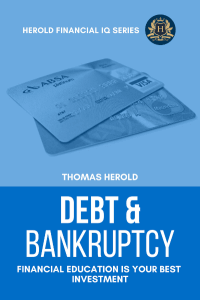 This practical dictionary explains over 140 of the most important and commonly used dent & bankruptcy terms. Every term is explained in detail, with clear and concise article style description and practical examples. This dictionary should not be relied on as legal advice. Predicting how bankruptcy may affect any given situation requires a knowledge of the facts surrounding that situation. Specific questions should be directed to a bankruptcy attorney. Taking time to understand the vocabulary can help you with your debt restructuring or bankruptcy planning, eliminating confusion, and get better prepared for a swift and smooth transaction.